Featuring German engineering, SS Adjustable Bases© are counterbalanced for easy one-handed adjustment. 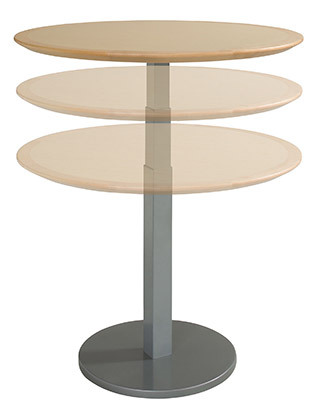 Tables can be adjusted continuously from standard through café height, making it unnecessary to bring in special tables for ADA compliance or for special events—saving labor, storage space, and furniture. Matching fixed-height bases are available. Note: the lift mechanism MUST NOT be operated with a load on the table surface—the counterbalance operates only without a load and the mechanism can be damaged by sudden free fall. Crank versions of this product are available if the table must be adjusted under load.